Mudra is defined in traditional usage as a seal, gesture or symbol of the hands, body or face to expand the breath, consciousness, or energy systems of the user. There are hundreds of mudras from the spiritual traditions of India and Tibet. Many of these are mudras for the hands, but also include gestures of the eyes, face and body. Commonly used in the practice of yoga and meditation as a tool to channel higher energies into the body, mudras are very often paired with pranayama (breath work), asana (physical postures) and mantras (spoken word). Mudras are a remarkably useful way to activate and awaken our physical bodies for self-healing and self-awareness. They have the added bonus of awakening and balancing the deeper levels of ourselves called the energy body. This deeper level includes the energy system, which is made up of meridians and chakras. If you have practiced yoga or experienced acupuncture or acupressure, you probably are familiar with these terms. It is not necessary however, to be an expert in energy medicine or yoga philosophy to use mudras in your daily life and reap the benefits. Below, are 3 mudras and their benefits to incorporate on a daily basis. Take some time to try these out and notice the shifts and sensation in your body, mind and spirit. How to: Allow both palms to face upward. Touch the tips of the thumbs to the tips of the ring fingers. Allow the other fingers to extend straight out. Relax the backs of the hands on thighs or in the lap. Benefits include: reduces stress, blood pressure, strengthens the downward flow of energy which is grounding, supports posture and centering of thoughts. How to practice: Use this mudra when you are seated or lying down. You can take a 5 minute stress break at work or home to bring yourself into a place of calm and center. Try it with your eyes closed and notice your breath and energy shift. How to: Hold the left palm open and just in front of your belly. Make a fist with the right hand, thumb facing up. Place the right fist in the center of the left palm. Relax shoulders down. Benefits include: Enhances digestion and energy. Assists spinal alignment and cultivates concentration and commitment. If you suffer from hypertension, please monitor for effects. How to practice: Use this mudra when you are seated or standing. You may like to use it before beginning a task or project or when you need to redirect your focus or commitment. Practice with eyes open, soft focus or gaze to assist in focusing awareness. Use this daily along with your personal intention to bring greater energy into creating your desires. How to: Bring the hands together in a prayer gesture. Keeping the heel of the hands together, allow the middle three fingers to open keeping the pinky fingers and the thumbs touching. Place the hands in front of your heart. Benefits include: Supports the cardio-respiratory and immune systems. Cultivates a sense of gratitude and awareness in the heart center. Opens energy in the front body. How to practice: This mudra is perfect to begin and end your day with. Waking in the morning, take some time to practice Padma mudra, to set your intention for the day. Plant that intention in the center of the palms and offer it up to the universe. In the evening, take a few minutes to practice Padma mudra as you reflect on all of the gifts in your life. Use this to assist you in feeling gratitude in your heart. Then practice sending empathy out of your grateful palms to assist others. You could practice one or all of these for greater heart awakening. 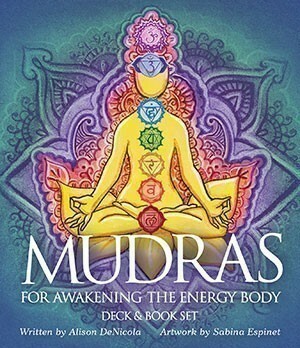 To learn more about mudras, explore Mudras For Awakening The Energy Body deck and book set written by Alison DeNicola with artwork by Sabina Espinet, available from US Games Systems Inc. This 40-card deck and book set is designed to awaken the energy body and support health and wellness in an easy and accessible way.